Home > News > Ordained Anglican women face "stained glass ceiling"
Ordained Anglican women face "stained glass ceiling"
New research by the Rev. Canon Dr. Judy Rois and the Rev. Dr. Alex Faseruk proves that throughout the Anglican Communion women have a hard time reaching top episcopal jobs—even when they’re technically allowed to become bishops. Dr. Rois and Dr. Faseruk’s paper “Why is the Stained Glass Window a Stained Glass Ceiling? Organizational Perspectives on Female Bishops in the Anglican Communion,” was presented February 2013 at North American Management Society conference in Chicago. Their paper traces the history of women’s ordination in the Anglican Communion and presents data about women in leadership across provinces. Researchers found gender bias active in many branches. Sometimes churches don’t allow women to become bishops, and other times women are just overlooked. For many in the Anglican Communion, the issue of women’s ordination is solely a theological question, but Dr. Rois and Dr. Faseruk choose a secular, organizational approach. The paper uses feminist metaphors of “glass ceilings” and “sticky floors” to explain how women struggle to advance their careers. The stories of such ceilings differ across the Anglican Communion. Researchers do not offer commentary on each country’s data, though Dr. Rois, currently executive director of the Anglican Foundation, sees anthropological analysis as a next step that could explain cultural differences. 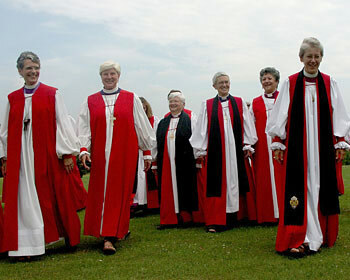 The Anglican Church of Canada first ordained women priests in 1976. The first female bishop, the Right. Rev. Victoria Matthews, was elected in 1993 and since then, six women bishops have been elected. This is nowhere near parity, but other churches, including the Church of England, are slower to allow women to become bishops. In November 2012, a General Synod motion to allow women bishops was defeated. “Our research was amazingly consistent with a lot of organizational norms,” said Dr. Faseruk, a finance professor at Memorial University and an ordained Anglican priest. Dr. Faseruk is interested in the human resources implications: How is the church preparing for future female clergy, especially when such bias exists? How will the church adapt to needs for maternity leave or second-career female professionals who enter seminary late? He said the paper was “phenomenally well received” at its conference debut, partially because of its “unique data base.” He and Dr. Rois are now pursuing publication, targeting Journal of Business Diversity, which has already published Dr. Faseruk’s research on management accounting among Anglican priests. Dr. Rois has been gradually researching this topic since she first began her academic life in the 1980s. She and Dr. Faseruk have collaborated for more than 15 years after meeting at a vocational diaconate conference. Ordained for almost 30 years, Dr. Rois has felt gender bias first hand. She began studying theology only five years after women were first permitted to join the Anglican priesthood in Canada. She said she grew up in a home where parents modeled gender equality. “It was the church where I learned inequality,” she said. While serving as an Anglican priest Dr. Rois has been the target of sexist slurs, been excluded from male-dominated social situations, and has seen men get jobs instead of more qualified women. Dr. Faseruk and Dr. Rois hope their research can lead to organizational change in the Anglican Communion, although both acknowledge that progress is slow. For more information about this research, email Judy Rois or email Alex Faseruk.